Plastic canvas is a great medium for many cross-stitch projects, including bookmarks, cards, and ornaments. You can also make other household items with this material, such as coasters and placemats. 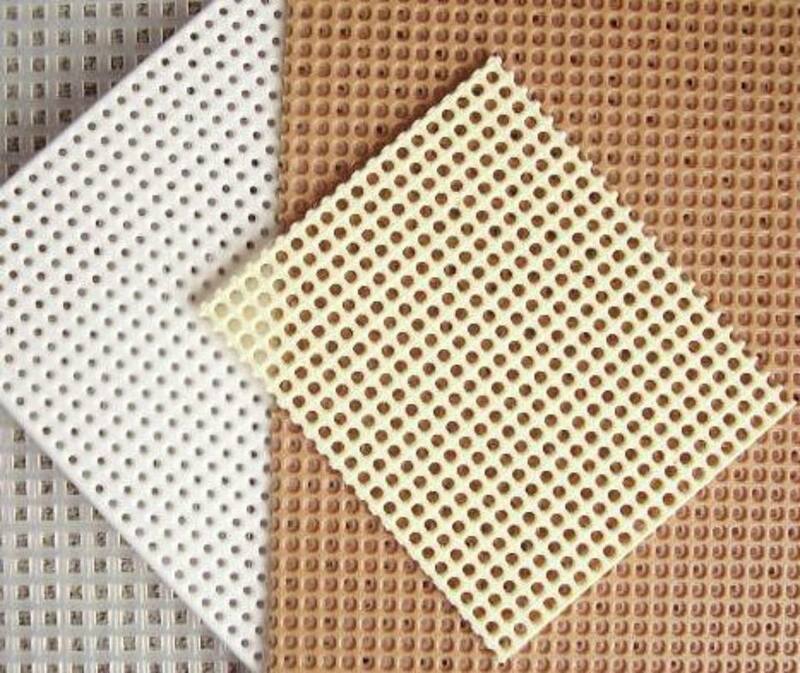 It's a type of plastic mesh that resembles a needlepoint canvas and can be used in a variety of needlepoint crafts, including cross-stitching. Plastic canvas for cross-stitching comes in a variety of sizes and, thus, different weights of floss can be used for each project. For a heavier weight, use yarn; for smaller projects, like coasters, you can use regular cotton floss. Cross-stitchers are often used to using a fabric canvas for their projects, then the question is, why switch to plastic? Plastic canvas is durable, so it can bend without breaking. Additionally, the plastic lasts a long time, which is good for household projects that get a lot of use. Plastic canvas will not rip, fray or shrink, nor do you need to tape off your plastic canvas for projects. Once a project is done, you will not need to worry about it falling apart. Plastic canvas can be used to create 3-D projects. This is a great piece of material to make doll houses, sewing boxes, and other fun 3-D projects. You can build up and out with your stitches instead of staying on one surface. You can also make beautiful one-of-a-kind pieces of jewelry, such as necklaces, bracelets, earrings, and rings with plastic canvas. You can also customize key chains and eyeglass cases. Cross-stitchers who are used to fabric canvases might need a little guidance in setting up and using plastic canvas for a needlepoint project. First, pick a simple project for your first time working with plastic canvas. An easy outline makes cutting out the plastic much easier. Because you can't work fractionals or French knots on plastic canvas, pick a design that contains only whole cross-stitch and backstitch. When prepping the canvas, cut out just enough for your design, but leave 2 inches around the edges. You can't put the plastic canvas in a frame or hoop, you need something to grasp onto while stitching. Once you have started stitching, begin with the loop method and work over one bar. Finish up by pushing the needle through stitches on the other side of the canvas. Use one fewer strand of floss when stitching on plastic canvas. Depending on the size of the plastic canvas, you might want to use yarn instead of floss. Choose yarn that is not fuzzy. You can use any kind of yarn, but cotton yarn will give you a cleaner finished project. Use a smaller-sized tapestry needle—ideally, a blunt plastic needle that is slightly flexible—when stitching on plastic canvas. The plastic canvas will not give like fabric will. Let your needle dangle frequently to avoid knots and over-twisting of the floss. How to pick the perfect cross stitch needle for your next project.